I was thrilled to find out that a new Grocery Outlet would be opening in Downtown Fresno this last May 22nd. Even though I live in Clovis, which is a suburb of Fresno, I still visit the Downtown Fresno area. Plus, a new store is great for our economy! For those that are unaware of what the Grocery Outlet Bargain Market is, here is a little rundown. 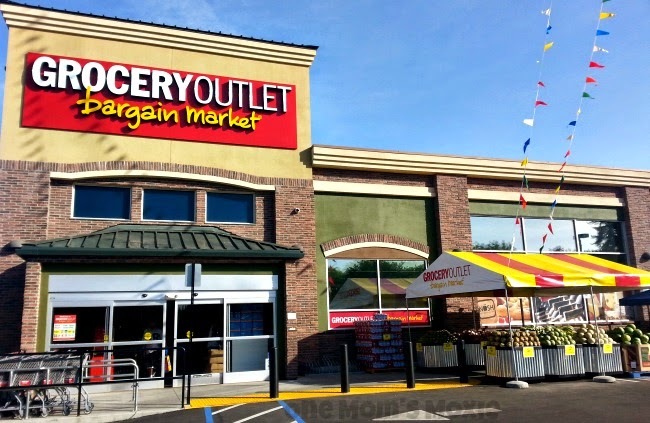 Each Grocery Outlet is independently owned and operated, like a franchise but so much better. All products are sold up to 50% off the retail value. Each Grocery Outlet carries different products, so you can't expect to find the same thing at another location, yes even if they are both in the same city. So when I was asked if I wanted to attend the grand opening, I was more than happy to check out the new store! I arrived at the grand opening with my sister-in-law, Vanessa, a new contributor for One Mom's Moxie. We were both happy to see fresh produce right out front, ripe for the picking. Once we made our way inside we were greeted with smiles and everyone working was incredibly helpful. While waiting to meet with Jamie, Grocery Outlet's Marketing Specialist, we had the chance to chat with Cassandra who is training to become a Grocery Outlet owner along with her husband. She explained to us that she was in Downtown Fresno to watch the store owner & operator Chris Caillier open his new store. 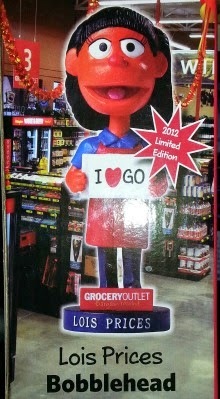 Her passion for the Grocery Outlet company was unbelievable. Both Vanessa and I left the conversation thinking we could become owners too! So we made our way over to the first aisle to start shopping. It took us twenty minutes just to get down that first aisle! In our defense it was filled with health, beauty, toys, cooking utensils and outdoor items. When we turned the corner we spotted the NOSH sign. 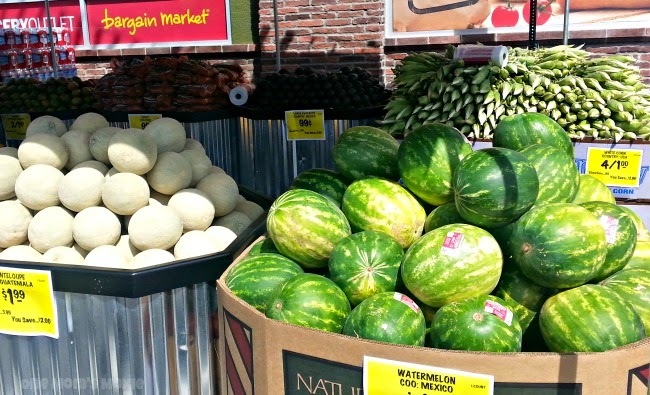 The fact that Grocery Outlet carries Natural, Organic, Specialty and Healthy items is awesome! We are slowly trying to buy natural, organic products but if you have ever bought anything natural, organic then you know how crazy expensive it can be. With the products and prices varying from one Grocery Outlet to another there's no one deal that we can share. 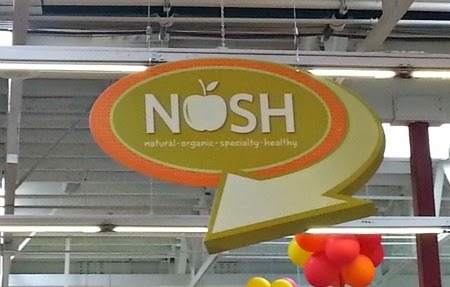 Not because we don't want to but it may not be available at your local Grocery Outlet or even this one, but we will say you will be impressed with the variety of NOSH products. This is just one side of the NOSH area. We were just looking around when we met with Jamie, Grocery Outlet's Marketing Specialist. She was so incredibly kind and very attentive. Once she knew we had children she excused herself and came back with not one but three of these fabulous Lois Prices bobbleheads! After talking with Jamie we continued shopping. We were both constantly amazed with the low, low prices! Everything was so clean and organized, every aisle was filled with various products but it never felt crowded or overwhelming. 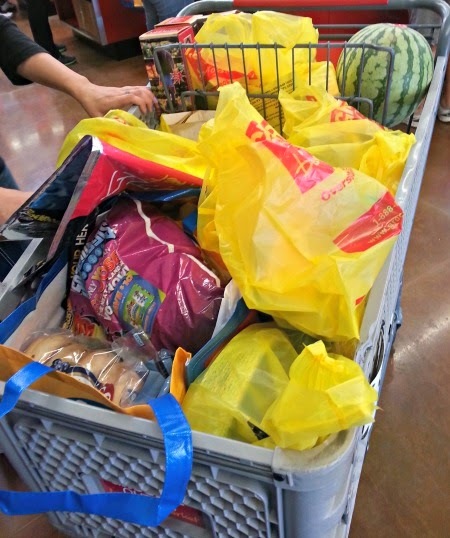 Just as we were finished with our shopping, we had spent two hours going all over the store, we headed to checkout. On the way we spotted the sign below. For all our local readers you don't want to miss your chance to win some cool prizes from the Downtown Fresno Grocery Outlet! 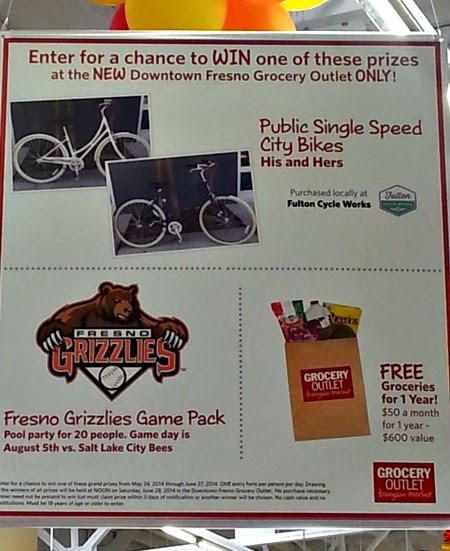 There's a chance to win His & Hers Bikes, Fresno Grizzlies Game Pack (we would love to win this!) and Free Groceries for 1 Year! You can still visit the Downtown Fresno to enter for a chance to win until June 27th. Both Vanessa and I entered the giveaway and continued to the checkout. Our grocery cart was filled to the top! We could have easily filled two or three carts with tons of great brand name products. Although we only spoke briefly with the owner Chris when he gave us a free watermelon, pictured above, from what I have read and heard about him he is a very giving person. Not only did the Downtown Grocery Outlet donate $1,000 worth of food to the Fresno Rescue Mission but he has the "Win What You Save" drawings. 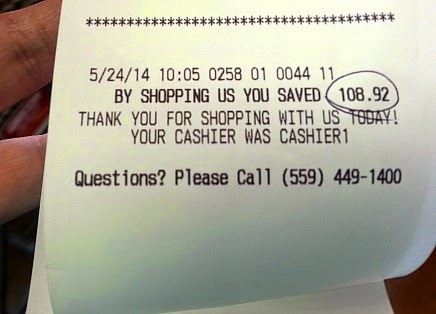 This means that every time you finish shopping the amount you saved, like the amount that we saved $108.92 pictured below, will be entered into a drawing that is done twice a month. So before you leave the Grocery Outlet make sure to tear off the bottom and put your name and number on the back to enter! Thank you Chris!! 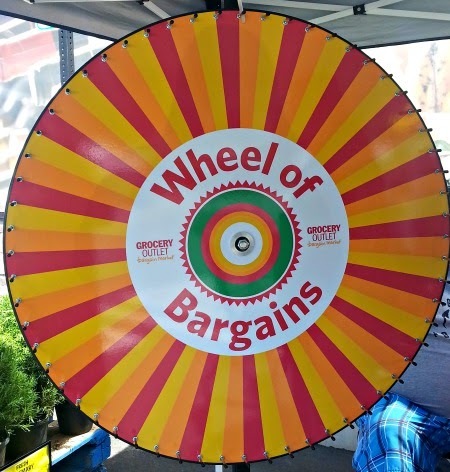 As we were leaving we couldn't resist spinning the Wheel of Bargains! They had this set-up as part of the grand opening celebration. They had some neat prizes. We missed the festivities later that day but they had face painting, food and a special visit by Lois Prices & Ben Saven. You can tell that Grocery Outlet is very family friendly, the employees are so welcoming and acknowledge the children as well. For us showing our children a little attention goes a long way! The generosity of the Grocery Outlet seems never ending. They have given us TWO gift cards to giveaway to our readers! So two lucky winners will each get a $25 gift card to use at their local Grocery Outlet Bargain Market. yes, i shop there and always get cheese; such good discounts on dairy. I've never shopped there before. I shop there all the time! I love it! I get cheese, cereal, coffee -- you name it. I shop there a lot. I get a lot of canned goods and bread and cheese. No, I have never shopped there before but they look like they have some great deals.